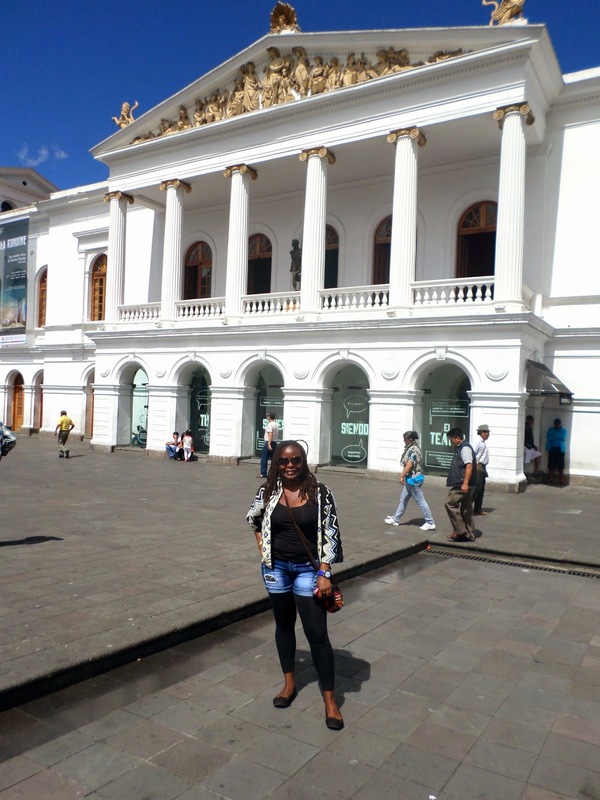 I finally got to enjoy a free walking tour of the historic district of Quito and I enjoyed it a lot, the guide was very knowledgeable and engaging making the tour fun. Last week I had walked around the historic district by myself and while it was fun, I appreciated taking the walking tour because thanks to it I was able to know the history behind some of the areas in the city and I was able to pin point the places I would like to go back to and explore more. The weather was really good and it never got overcast as it normally does, the sun was in full force and at times it actually felt really hot but not hot enough to make it uncomfortable. It sure helped with picture taking because it was bright outside. View from the presidential palace. There was a traditional summer solstice celebration taking place at this plaza. The city tour guide explaining the process of chocolate making. After the tour I grabbed some lunch then met up with this really sweet girl that I had connected with through couch surfing. She had invited me to hang out with her and her friends and I met up with them after the city tour. We were supposed to go to a concert in the evening but plans changed so after hanging out for a while everyone split up and went their separate ways but not before taking a group photo. On Sunday which is today, I finally moved to a new place and I love it!! 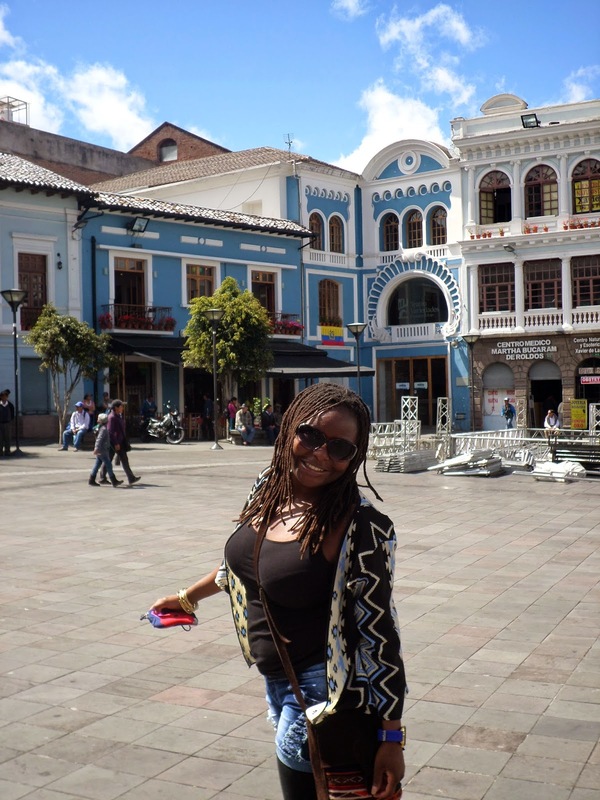 it's official ya'll, I am staying longer in Quito. The room I got is super cute! the apartment is clean, bright, warm, the water pressure is the best and most importantly my hostess is really sweet and used to be a Spanish teacher so I get to practice my Spanish with her. There is another American guy renting a room in the apartment as well and he is very friendly, we have made a pact not to speak to each other in English because we want to learn Spanish, he speaks way better Spanish than I though. You have no idea how I felt arriving to this after the dumpy place I had lived in for the past two weeks. Yes, that's a real rose flower and there were chocolates included as part of my welcome to the home. The chocolates came from my hostess' family that makes them and they were darn good! It did not take long to unpack everything and finally feel settled. I took a walk around the neighborhood to familiarize myself with the area and found out that there is a huge artesian market not too far from the house and I believe it is open everyday. It's located at a huge park and there were lots of people around which made it exciting for me. That's it folks! phew you can now breath out, feels like I was on a marathon with this post. Too many things to be covered and my mind was all over the place. I feel settled here in Quito and I want to make it my main base in Ecuador until it's time to move on, I hope I don't change my mind because it could happen. The bed in my new room is super comfortable! I will have a hard time waking up early in the morning. Ooh! wait, I don't have to work and my Spanish classes are in the afternoon. I am not rubbing that in, promise! On Sundays almost everything is closed around here and the streets are much quieter. Walking around my new neighborhood today actually felt peaceful because the streets were empty and I took my time familiarizing myself with the different streets. It is very common here for people to ask you your age and religious beliefs out of the blue. Every time I have a conversation with a taxi driver or someone I really don't know, I always say I am an exchange student here in Ecuador learning Spanish. Well, technically I am a Spanish student after all so it's not too far fetched. Today pigs must have flown because I found myself actually watching soccer/football in the apartment and enjoying it. My hostess joined me later on but trust me, I even surprised myself! I guess being in a place where soccer/football is like a religion, the enthusiasm does rub off on you. Speaking of football, I am so neutral and don't have a favorite team so watching the different games is not nerve wracking for me because I am not emotionally invested. Trust me! emotions can get pretty high and I have seen tears being shed. Turns out I either have a strong stomach or good luck. I have been drinking water straight from the tap and have had no issues. When my hostess was showing me around the house she was telling me never to drink from the tap because the water is not very clean and I could get sick. You should have seen her reaction when I mentioned I had been drinking water from the taps through out, starting in Colombia and now Ecuador. I was having a conversation with my hostess and she was telling me about the time she lived in England and spoke no English. She said the day she dreamt in English is the day she started getting fluent in the language. I have yet to dream in Spanish, come to think of it I don't even know if there is speech involved in my dreams because I do not remember anything!